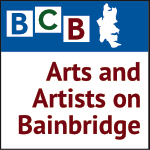 Artist Dorothy Brown’s paintings explore “My Art of Jazz.” Experience them at the library during the month of August, and don’t miss the opening — August 3rd at 5:30 pm. 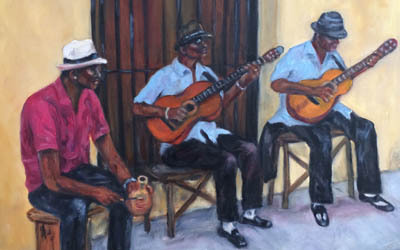 The paintings, created in oils and inspired by the jazz musicianship of Dorothy’s husband and son, depict the musicians, dancers, and audiences Dorothy encounters in the world of jazz. 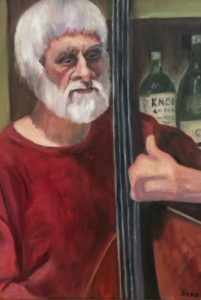 Like jazz, the paintings are improvised, and are meant to capture moments in time rather than exact likenesses of the subjects or their instruments. So come see the show, and experience this charming tribute to the music and musicians of jazz!